Author: Rozan, S.J. Set In . . .
S. J. Rozan is widely regarded as one of the finest crime writers to emerge in the past decade. Praised by critics and colleagues alike, her works have been finalists for most of the major awards and have won both the Shamus and the Anthony Awards for Best Novel. Now, with Reflecting the Sky, she has written her finest, most broad-ranging novel to date. 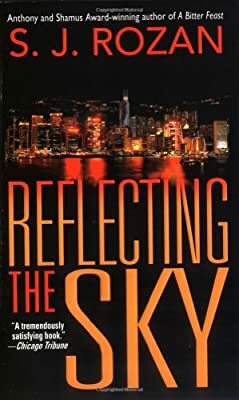 Lydia Chin, a Chinese-American private investigator in her late twenties, is hired by Grandfather Gao, one of the most respected figures in New York City's Chinatown, for what appears to be a simple task. Lydia, along with her professional partner Bill Smith, is to fly to Hong Kong to deliver a family heirloom to the young grandson of a recently deceased colleague of Grandfather Gao. They arrive in Hong Kong safely but before they can deliver the heirloom, the grandson is kidnapped and two, separate ransom demands are made. While the family of the kidnapped boy tries to freeze them out, Lydia and Bill must quickly learn their way around a place where the rules are different, the stakes are high, and the cost of failure is too dire to imagine. Reflecting the Sky is a 2002 Edgar Award Nominee for Best Novel.